This distinctive skipper is uncommon in Massachusetts and may be in a downward phase. Hoary Edge is at the northern limit of its range here. It has not been reported historically or recently from Maine (MBS 2013), nor recently from Vermont, although there is at least one historic record there and a few historic records from New Hampshire (VBS 2011; BAMONA 2010). John Abbot in the 1780's in Georgia was the first to figure this species (as well as Silver-spotted Skipper and Long-tailed Skipper), saying that Hoary Edge “Feeds upon the Beggars lice (so called from the seeds sticking to people’s Clothes).” He showed the caterpillar feeding on a species of Desmodium (Calhoun 2006a; Scudder 1889: 1422). With the clearing for agriculture in New England between 1600 and 1850, Hoary Edge probably either increased in this region, or arrived here at that time (Table 1). It’s open-area legume host plants undoubtedly increased. Scudder wrote that Hoary Edge was a “rare insect” in New England, confined to the southern portions of the region. “Uncommon” might have been a better characterization, because Hoary Edge had “occasionally occurred in abundance in New Haven and vicinity,” had been found in Plantsville and New Britain, Conn., and “two or three are taken every season near Springfield [Mass.]”. H. W. Parker caught a male on Mt. Holyoke on June 25, 1874, the first to be found in the Amherst area (Parker 1874), and F. H. Sprague took one the last of July, 1878, in North Leverett (Sprague 1879) and another in Amherst (July 12, 1886, MCZ). Thus, Hoary Edge may have been moving up the Connecticut River valley at this time. Scudder also reports it from the vicinity of Boston, saying that single specimens had been taken in such places as Waltham, Winchester, and Wollaston (now in Quincy). Scudder even reports three or four specimens from Milford, N. H., a location not far from Nashua in the Merrimack River valley (1889: 1421).. In Waltham in 1897, C. Bullard took so many specimens, most of them in nearly perfect condition, that one suspects a local population explosion (11 specimens in 1897, 1 in 1896, MCZ). Malden must also have had good habitat, since Sprague found it there in 1896 and 1898 (MCZ), and there are two turn-of the-century specimens at Boston University. There is also an 1889 specimen from Sherborn (E. J. Smith, BU), and in Wellesley in 1896, the Denton Brothers captured at least two specimens (MCZ Denton mount collection). By 1934, Farquhar was able to list specimens from several additional towns around Boston: Stoneham (C.V. Blackburn), Melrose (R. W. Harris), Middlesex Fells (C. A. Frost), and Medford (J. H. Rogers), widening the circle of locations from which Hoary Edge was known. In the 1940's, Hoary Edge was also collected from Wellesley (May 3 and June 10, 1942, V. Nabokov, MCZ), Milton Blue Hills (June 17, 1940, H. Clench, BU), and Waltham Prospect Hill (June 10, 1949, C. Gottschalk, Yale). However, it was apparently not present on Martha's Vineyard or Nantucket, since it is not listed by F. M. Jones and C. Kimball (1942) and there are no specimens. There are also apparently no historic specimens from Cape Cod. Hoary Edge seems to have been increasing during the 1960’s and 1970’s, when it was extensively reported in the Lepidopterists’ Society Season Summaries. The main reporting locations were still in eastern Massachusetts and the lower Connecticut River valley. Increasing urbanization and perhaps attendant warming in those areas may have been facilitating an increase in this species (Table 2). Charles D. Oliver observed three in Belmont in July 1965. Edward M. Peters captured one male on July 15, 1971 in Carlisle, saying that while Silver-spotted Skipper was quite common there, Hoary Edge was not. In 1973 J. 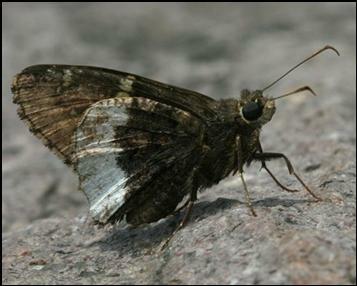 Levy and R. Robbins found several Hoary Edge June 12 through July 4 at Medford's Middlesex Fells reservation, a location from which this skipper had been known since the 1930s. And Patrick Carey of South Hadley submitted an extensive report covering the Springfield area. He collected a Hoary Edge “at the base of the hill [Cedar Knob, Holyoke], out of the woods, visiting flowers, in late June.” In 1972 N. Franks collected a Hoary Edge in Wellesley on July 19, and in 1974 William D. Winter collected a Hoary Edge in Sherborn on July 22. Both these specimens are now in the Harvard MCZ. The 1974 and 1975 seasons saw Hoary Edge particularly well reported, with notes from R. Robbins calling it “high and expanding” in 1974 and “common” in 1975. Darryl Willis, reporting for the Holliston-Framingham (Middlesex Co.) area, found Hoary Edge “becoming common, noted ovipositing on tick trefoils” in 1974. Willis did most of his collecting in what is now referred to as the Sherborn power line area. He found a total of 72 species there, and once (July 4, 1975) took specimens of 48 species there in one day! The power line remains a productive habitat today, and has been much frequented by MBC members 1990-2013. Willis reported A. lyciades “still not uncommon” late May to late July, 1975, noting that “Apparently, this species is well-established. It will be interesting to see if it can weather the severe winter of 75-76” (letter to Paul Grey, 2/4/76; Lep. Soc. Seas. Sum. and Correspondence, 1959-1976). Apparently it did, since Deane Bowers found it at Montague June 20, 1976 (Lep Soc Seas. Sum. 1976). This was the northernmost report in Massachusetts at that time. Hoary Edge’s caterpillar host plants are mainly various tick-trefoils, especially showy tick-trefoil (Desmodium canadense), which is quite common in our area, but also bush clovers (Lespedeza spp.) and other legumes. Scudder (1889:1422) gives a good description of the caterpillar’s way of using Desmodium, stitching together two nearby leaves toward the top of the plant, then leaving the nest and moving downward as it needs to make use of larger leaves. During the 1980’s Massachusetts Atlas period, Tom Dodd observed Hoary Edge ovipositing on panicled tick-trefoil (D. paniculatum) and round-headed bush clover (Lespedeza capitata). In 2013, Elise Barry photographed Hoary Edge ovipositing on showy tick-trefoil (click here for photograph). Additional evidence as to New England host plants comes from the 1995-99 Connecticut Atlas, whose field workers found Hoary Edge eggs or caterpillars in the wild on tick-trefoils (Desmodium spp. ), bush clovers (Lespedeza spp. ), wild indigo (Baptisia tinctoria), and groundnut (Apios americana) (O’Donnell et al., 2005). Showy tick-trefoil is found in every county in Massachusetts, including the Cape and Islands. In addition there are 11 other tick-trefoils in the state, some also widely distributed (Sorrie and Somers, 1999; Magee and Ahles, 1999). Hoary Edge prefers dry, upland areas, open dry sandy woodlands, and woodland edges. But it ranges widely in search of nectar; nineteenth century collectors like Scudder found it on butterfly weed and garden phlox; today we find it on common milkweed, red clover and dogbane. It often basks on exposed soil, defending its territory. MBC records 2000-2007 rank Hoary Edge toward the lower end of “Uncommon,” about on a par with Southern Cloudywing and Sleepy Duskywing (Table 5). It contrasts with Silver-spotted Skipper, which is “Common.” The 1986-90 MAS Atlas also ranked Hoary Edge as Uncommon, having found it in only 28 out of the 723 atlas blocs searched. MBC records show it in 52 towns out of a possible 315. Hoary Edge may have been expanding in the 1960's and 1970's, but it appears to be declining today. MBC sightings per total trip reports (Chart 72) indicate a sharp decline in the relative abundance of Hoary Edge over the last 19 years. There was a decline in sightings from 1992 to 1996, then an increase 1996-1999, and fairly steady decline thereafter. In addition, the important list-length analysis of MBC data found a statistically significant 71.1% decline in Hoary Edge over the 1992-2010 time frame (Breed, Stichter, Crone 2012). Both signals are pointing downward for this species in this period..
A slightly different calculation using the same data also indicates recent decline in Hoary Edge sightings. In 2007, 2008, and 2009, the average number of Hoary Edge's per trip report decreased 32%, 57%, and 82% relative to the average for the preceding years back to 1994. The number of reports of this species, and the maximum number reported, were also down in 2008 and 2009 relative to prior years (Nielsen, Season Summary, MB 2008-2010, No. 30, 32, 34). 1999 was an outbreak year for all spread-wing skippers, including Silver-spotted, Juvenal’s, Horace’s and Sleepy Duskywings, as well as Hoary Edge. That year 50 Hoary Edge were reported on the Truro (Outer Cape) NABA Count (the only report from Cape Cod in these 19 years), and 25 at Fruitlands Museum in Harvard, Mass. It has not been reported from either of these locations again, despite searches. The 1986-90 Atlas had found Hoary Edge “in a swath from northeast to south central Massachusetts with no records from western, north central, most of southeastern Massachusetts, or Cape Ann, though many of the areas where it was unrecorded were well covered during the Atlas.” Hoary Edge was apparently absent from the southeast coastal plain, and Cape and the islands. BOM-MBC data largely confirm the Atlas distribution, but also expand it: Hoary Edge is now reported from much further north up the Connecticut River valley (notably Montague, Gill and Greenfield), from more towns in central Massachusetts (Worcester and surrounding towns, with many reports from the Blackstone Valley area southeast of Worcester), and from Carver (Myles Standish SF) in southeastern Massachusetts. Hoary Edge has been reported from 54 towns in this period, but very few new towns have been added since 2009. In the upper Connecticut River valley, there are now Hoary Edge records from Montague (1993 and 2013, 1, M. Fairbrother; 2000, M. Mello), Greenfield (1995, 2, M. Fairbrother), Gill (1999, 2, Butterfly Institute), and Leominster (2008, 1, R. Hopping), as well as Bowers' 1976 report. In addition, the skipper has been found in small numbers (1 – 7) every year from 1999 through 2013 (15 years running) on the Montague-based Central Franklin County NABA Count. In the northeast (Essex County), MBC records add Boxford and Newbury to the Atlas reports from Andover, North Andover and Newburyport. These are the northernmost reports for New England at this time. Oddly, there are still no reports from Cape Ann, despite searches throughout the period by D. Savich and C. Tibbits. Hoary Edge is still not found in Berkshire County, nor on Martha’s Vineyard or Nantucket. Neither the Atlas, the 1991-2013 BOM-MBC records, nor BAMONA (2010) have any reports from these areas. The Connecticut River valley remains the key locale in western Massachusetts, with Northampton and Greenfield the furthest west towns. The single BOM- MBC report from the southeast (Plymouth and Bristol Counties) is from Carver, Myles Standish SF, 2 on 6/27/2010, M. Arey. Myles Standish should be searched again, since the habitat seems likely. Similarly, the single Cape Cod (Barnstable County) report is of 50 on the Truro NABA Count in the boom year 1999. Mello and Hansen (2004) do not mention Hoary Edge as occurring on Cape Cod, and there are no reports from the Truro area subsequent to 1999. The July NABA Counts usually catch this species if it is present. Hoary Edge has never been reported from any of the three long-running Berkshire Counts, nor from the Martha's Vineyard or the Bristol County Counts. By contrast, it was in this time period fairly regularly reported from the Blackstone Valley Count (18 on 7/14/2001, but 1 in 2009 and 2011, 0 in 2012 and 2013), and from the Foxboro (1993-2000), Lower Pioneer (1992, 1995), and Northern Worcester (most years 1996-2006, but 0 after that) Counts. The Central Franklin Count, mentioned above, is the only Count to report Hoary Edge consistently from 1999, and the only one to report it in 2012 and 2013. Occasionally small colonies of Hoary Edge can be found, but usually it is seen only in small numbers (<5) at any one site. One exception was the boom year of 1999 (Chart 72), when 12 were reported in Sudbury on 6/20/99 (R. Walton), 25 at Fruitlands Museum in Harvard on 6/30/99 (J. Choiniere), and an unusual 50 reported from the Truro (Outer Cape) NABA Count on 7/17/99. 2001 was also a good year for Hoary Edge, with 10 reported from Broad Meadow Brook Sanctuary in Worcester (G. Howe, 7/1/2001), and 9 from the Rt. 169 power line in Charlton (R. Hildreth, 7/2/ 2001). Berlin Berlin Farms, 2 on 6/17/2013, C. Kamp; Burlington Mary Cummings Park, high count 3 on 7/4/2007, E. Nielsen et al. ; Canton Great Blue Hill, many reports, high count 6, 7/8/2006, M. Champagne and E. Nielsen; Charlton power line, many reports, high count 18 on 7/1/1998, R. Hildreth; Charlton Rt. 169 power line, 8 on 6/7/2001, R. Hildreth; Grafton Dauphinaise Park, many reports, high count. 3, 6/12/2004, D. Price et al. ; Holliston Whitney Swamp, 4 on 6/30/2001, R Hildreth; Hopedale Draper Park Old Dump, 2 on 6/25/1999, T. Dodd; Medford Middlesex Fells, 2 on 7/4/1995, B. Malcolm; Milford Rt. 85 power line, 3 on 7/10/2001, R. Hildreth; Milford power line, 6 on 6/25/1999, R. Hildreth; Montague sand plains, 1 on 7/6/2013, T. Gagnon et al. ; Newbury Martin Burns WMA, 2 on 6/24/2004, S. Stichter et al. ; Waltham Prospect Hill, 3 on 6/28/2007, J. Forbes; Woburn Horn Pond Mountain, many reports, high count 8 ,7/5/2000, R. LaFontaine, 2 on 6/18/2011, M. Arey, photo by H. Hoople, 2 on 6/22/2010, B. Zaremba; Worcester Broad Meadow Brook WS, 11 on 6/20/2013, F. Model, photos, mating and egg-laying photographed (click here for photograph). According to the MBC flight chart, based on 1993-2008 sight data, Hoary Edge flies from the first week of June through the first week in August; peak flight time is the third week in June through the third week of July ( http://www.naba.org/chapters/nabambc/flight-dates-chart.asp). Earliest sightings: In the 23 years of BOM-MBC records 1991-2013, the six earliest "first sightings" are 6/5/2004, Milford power line, B., R. and M. Walker; 6/5/1993, Milford, R. Hildreth; 6/6/2010 Agawam, C. Kamp; 6/6/2009 Westborough, S. Moore and B. Volkle; 6/6/1991 Franklin, B. Cassie and L. Lovell (cited in the Atlas); and 6/7/2001 Charlton Rt. 169 power line R. Hildreth. Latest sightings: In the same 23 years of BOM-MBC records, the three latest "last sightings" have been 8 August 1991, Woburn, R. Walton (cited in the Atlas); 5 August 2000, Norfolk, B. Bowker; and 3 August 2003, Canton Great Blue Hill, E. Nielsen. Scudder (1899: 1422) had indicated that Hoary Edge flew “until about the middle of July; but all July specimens are invariably worn and battered.” The mid-July date accords with today’s peak flight time, but the small number of recent observations in August do seem to indicate some extension of the flight period compared to a century ago. Current and historical sources indicate that Hoary Edge has only one brood in Massachusetts, and thus far there is no evidence of a partial second brood. Opler and Krizek (1984:203) indicate that only in the deep South is this species fully bivoltine; Allen (1997) reports a partial second brood in West Virginia in warmer areas at lower elevations. Hoary Edge is multiphageous, using several very common weedy host plants, but has not adopted an aggressively spreading host as has the Silver-spotted Skipper. Also unlike Silver-spotted, there is no evidence of a second brood. The fact that Hoary Edge is strongly univoltine in this climate limits its abundance here. It is also limited both by cold winter temperatures and by the length of the warm season. One might expect that climate warming would lead, or would have already led, to some increase in Hoary Edge numbers in Massachusetts, but the reverse seems to be happening. This species' recent downward slide suggests the need for more careful field searches and monitoring of known occurrences. Its present NatureServe rank of S4 or "apparently secure" here may not be warranted.